What is the fabled Witching Hour and does it actually exist? What Is The Witching Hour And Does It Exist? If you’ve hung around folklore for long, you’ve probably heard of the witching hour. In occult terms, it’s apparently that time when witches and demons are at their most powerful. It’s sometimes referred to as a ‘chime hour’. The phrase does also have uses in different areas. So the time your baby might cry every night, or even stock market volatility, is sometimes called the witching hour. While researching this post, I found plenty of old newspaper articles that used the phrase in relation to political events. It seems the journalists of old enjoyed the mystery associated with the phrase. But for the purposes of this post, we’re sticking to the occult version. Hit play on the player below to listen to the audio version of this post or keep reading! So when is the witching hour? Some people believe it begins at midnight with a new day. Look at the fairy tales in which a spell breaks, or wears off, by midnight. A simple news article about a heavy snow storm in Cheshire refers to “the witching hour of midnight” (Chester Chronicle 1857: 6). They’re pretty definite on when they think it happens. But a short piece in the Shields Daily Gazette from 1890 by Blackwood’s Magazine disputes the idea of a witching hour. For them, it lasted far longer. According to the piece, “[t]he witches of the olden times had a much longer time to themselves – clearly up to sunrise” (1890: 4). 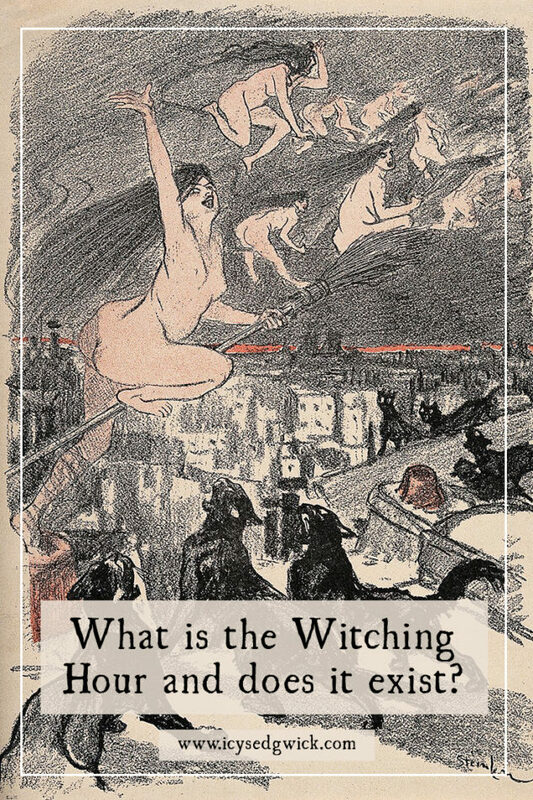 The article disputes the idea that witches “are nearly always represented nowadays as fleeing at the midnight hour” as being “a very modern notion” (1890: 4). For them, the witches actually have from sunset to sunrise. Bear in mind the article does draw its ‘facts’ from the legend of Tam o’Shanter and the apparent folklore knowledge of Robert Burns. So we can potentially take their argument with a pinch of salt. Others believe the witching hour to be the hour between 3 am and 4 am. So it’s a time when most people are safely tucked up in bed, fast asleep and ostensibly dead to the world. 3 am is sometimes known as the Devil’s hour. Christ is believed to have died at 3 pm, so naturally, the Devil is an inversion of that. Or could it be the fact that the demonic likes to do things in threes to mock the Holy Trinity? That really depends how much you want to listen to Ed Warren in The Conjuring. Commentators noted the fact that Butch DeFeo (of Amityville Horror fame) murdered his family at 3:15 am. (I’d also point out I was born between 3 and 4 am…make of that what you will). While researching this post, I did find some people disputing the time. The rather amusing New Zealand horror comedy Deathgasm even sees the hapless heroes tasked with performing the Black Hymn during the Devil’s Hour to avoid the ascension of a demon. They (quite logically) ask if the Devil observes Daylight Savings Time. But we’re not going to split hairs about the time of day. We’re just going to look at what it is. So where did the witching hour gets its name? Some believe it was because witches were more active at midnight (or 3 am). According to this theory, the forces of darkness are more active during the night. They make it a more powerful time to do magic. I’d venture to say “hogwash” to that. Given the persecution of those labelled as ‘witches’, it’s hardly surprising they’d conduct their activities under the cover of darkness. Not to generate more power – but to simply work without interruptions. If you were mixing up a love potion for a client, would you want all and sundry gawping at you? (Read Willow Winsham’s Accused to learn more about the persecution of witches). Also, patterns of sleep were very different in earlier times. Lucy Worsley explains the theory first put forward by historian Roger Ekirch that before the industrial revolution, people largely slept in two instalments (2011: 95). It’s unsurprising since heating and lighting was scarce, so spending time in bed was a good way to pass the cold winter nights. That said, “[t]he British night lasts fourteen hours in winter, and human beings simply don’t need to sleep for that long” (2011: 95). Hence the first and second sleep, with a break in the middle. Growing urbanisation and better forms of artificial light meant people could dispense with the two-sleep model. So many people could have been up and about at 3 am, doing very mundane things indeed! Does it affect ghost stories? Sometimes. Many believe that ghosts are more active at this time because the veil between the worlds is thinner. Apparently, mediums are more active during the witching hour. Precisely because the ghosts are. Perhaps that theory might have more credence if ‘psychics’ like Sally Morgan held their seance stage shows at 3 am, instead of 8 pm. It’s possible that ghosts are more active at this time purely because people notice the time when they’re startled during sleep. If something wakes you during the night, your first instinct is usually to check the time. When I did paranormal investigations at sites like Newcastle’s Castle Keep, we often finished up at 3 am. Everyone was tired and any activity had often calmed down by 2 am, if not sooner. Were the ghosts finding it harder to manifest because we ran out of energy? Or we were just too tired to see them? I’ll leave that one with you. Does the witching hour actually exist? Popular culture would have you believe that it does. Personally? I don’t think so. When even Martha Stewart is getting on the witching hour bandwagon, you have to start asking questions. Time zones make things difficult, as they always do. I’m in GMT so my witching hour will be different from that of EST. Don’t forget the problems associated with clocks going forwards or back to suit the season. Although that could lead to some comic encounters among the dead. I don’t think supernatural entities restrict their activities to a certain time of night. I also don’t think that witches were only active for an hour. The folklore is surprisingly scant. Much of it relates to the supposed activities of witches, demons and ghosts. But I did find one incredibly interesting reference in American folklore. Candi K. Cann discusses La Mala Hora, translated as ‘The Evil Hour’. Naturally, that becomes ‘the witching hour’. But here’s where it gets interesting. The Evil Hour is not a time of day, but rather an evil spirit. She wanders country roads and haunts lone travellers late at night. La Mala Hora often appears at the crossroads, and seeing her is apparently an omen of death. She doesn’t actually kill anyone – she just reminds people that they will die at some point. (Well, she’s right. We will). Here, La Mala Hora is essentially a warning to avoid lonely places late at night. I think I prefer that interpretation of the witching hour. And there’s a lesson there to be learned by us all. How about you? Do you believe in the witching hour? Did you enjoy this post? Add your email below and you’ll never miss a folklore article. I’ll even send you my recommendations for five excellent folklore podcasts as a welcome gift! Blackwood’s Magazine (1890), ‘The Witching Hour’, Shields Daily Gazette, 25 September, p. 4. Chester Chronicle (1857), ‘A Wise Sheep’, Chester Chronicle, 18 April, p. 6. Worsley, Lucy (2011), If Walls Could Talk: An Intimate History of the Home, London: Faber and Faber. I’ve always been told the witching hour was the safest time to celebrate pagan rituals/do pagan work during the burning times, as you described. The stuff about the devil just sounds like religious propaganda. I always quite liked the wee hours because it’s so quiet. It’s hardly surprising others might choose such times if they don’t want to be disturbed. How about Friday 13th? My grt grandfather is supposed to have died on the thirteenth hour of Friday the thirteenth. I usually try to avoid doing dangerous things on Friday 13ths! Friday the 13th would be another blog post entirely! I have also heard that it was noon until 1 am, hence the blog post. How would I open my (third eye) 3rd eye? My names is James David Purtlebaugh Jr. Please contact me back on facebook if you could I would greatly appreciate it. Another interesting post. Thank you! I tend to wake up frequently between 3-4 am. Tonight, I was awoken by a bat flying in my face randomly in my dream. I do believe there’s something going on while we’re out of it. Thank you so much for your well-informed article!! Ah dogs know what is really going on! Does Friday the 13th affect 3 AM? PLEASE reply before 12 o clock PM. I need this information!!!!!!!!!! Sorry, I didn’t see this sooner! I would have thought it was 3am every day… and there’s lots of evidence to suggest Friday 13th has no bearing on anything anyway. I’m guessing my 11 yr old daughter is a medium because that’s what my medium friend says. My daughter sees lots of different spirits in our home and she says she gets woken up almost every morning at 3am on the dot. She says she doesn’t know whether the spirits are waking her up or what the reason could be. She doesn’t mention seeing them a whole lot at that time except for when it’s a full moon or a new moon. She came in my room the other night and says “mom I see them everywhere in there. What’s going on?”. So I look up the moon phase calendar and it was a new moon. She sees the spirits all the time even during the day but more of them and more often on a full or new moon. We still are not sure why she wakes up at 3 am every morning though. It could be the Witching Hour. But the body also gets used to waking up at set times. Does she also wake up at 3 am if she’s not at home? Like on vacation? First of all I want to thank you for an enjoyable read. The way I was taught the ‘witching hour’ was when the moon is at its peak in the sky. This time constantly changes and to my understanding spells were cast when astrological alignments were favorable for the certain spell, which all could effect the actual time of day. What are your thoughts on that? My thoughts on a time of day that ghost activity is higher; is on the fence. I have had experiences during the day with shadowy figures appearing in photos taken during the day. I feel like the energy presence could just chose to interact or not. You’re right, a lot of magical systems follow ‘correspondences’ so to get the best results, you’d cast a spell when the astrological conditions were right. Based on that logic, yes, the witching hour would move throughout the day depending on what you needed! I would like to clarify to everyone. I am a pagan witch and the crap you see in movies is well crap. The true witching hour is from 11:30 pm-11:59 pm when you do good work. 12 am-12:30 am is when you do workings for bad things. Christianity believes that the Witching Hour or “Devils Hour” is at 3 am as an inversion of Christ. However; they are wrong and have been. I’ll be honest, I’ve never come across that in any of my reading. Most of the witchcraft texts I have recommend planetary hours for workings, which have nothing to do with 11:30 – 12:30. I suppose it just depends what people are taught. I have to say there is something to the idea of a witching hour. I was in the fire service for 30 years and after about 15 years I began to notice a pattern in our calls. Most emergency calls at night were between the hours of 3 and 4 a.m. I began to notice this pattern and did a history search of our response reports and found that there were a higher percentage of calls during that time than at any other time of the day. Strange. That is weird. Did you ever figure out why? I have had many phenomena happen to me at night and not in the daytime !